Imagine soft laughter, the clinking of glasses. Touches of sunlight illuminate plates of fresh food. A light summer breeze weaves between tables, but not just any tables, these are your tables on your restaurant’s outdoor patio. And these tables are full of happy customers enjoying the great outdoors all the while paying for drinks and food. Offering al fresco dining is so much more than just expanding your seating capacity or increasing your curb appeal. So how can building an outdoor patio boost your profits? Because it gives your customers more space for special events, shows off your restaurant from a distance, and gives them a comfortable spot to stay longer and keep the good times going. Here are just a few of the benefits that your restaurant can take advantage of by integrating an outdoor patio into your business plan. Patios add more space. By having a patio space, you not only have room for more activities, but also an opportunity to offer a breath of fresh air to your restaurant. This is all depending on the environment around you. The empty lot next to your restaurant could be your future bustling patio. But acquiring space is not always the answer, sometimes you can make better use of the spot you already have. If you’re short on space but have some room in front of your restaurant, adding sidewalk seating can be an option and create a café vibe. If you have a flat rooftop that you have access to, you’re in luck! Rooftop bars are very trendy and give a secluded feel to what are often crowded city bars. Having a patio can give you room for exciting events like live music, games, or a fire pit for chilly evening dining. More involvement at your restaurant can lead to more people having a reason to stop, staying longer, eating and drinking more, and therefore, increasing your profits. All of which can happen right in the outdoor space you may already own. Patios are free advertising to foot traffic. Making a successful outdoor patio space could be your best advertising asset. Depending on the way that your restaurant is set up, it may be the very first thing a customer sees. 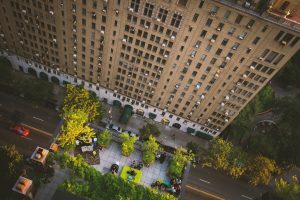 If your location is by a landmark, attraction, or even just a beautiful landscape, having an outdoor dining area should be a given for your restaurant. The sight of current customers having a great time and the scent of fresh food can bring potential customers from the street that would have maybe not chosen your restaurant. It’s like a free sneak peek of what customers can expect when they come to your restaurant, and can be used to your advantage. 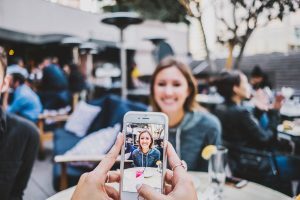 While customers are having a wonderful night out with friends and family, make sure you have your social media hashtags and Snapchat usernames in plain sight. If guests take a picture and post it, they will know exactly what location to tag. With that in mind, it doesn’t hurt to create a Snapchat filter exclusively for your business either. Creating a patio that is visually-stimulating can attract and keep potential and current customers coming back for more. More traffic means more sales for you! Patios relax customers, leading them to spend more. If you already have a happy hour, make it a patio-exclusive. Patios are a great way to give happy hour guests an exclusive area for drinks and appetizers, making it feel less stuffy than trying to crowd them in with those enjoying a meal. Having a patio-only happy hour can make guests feel relaxed and can lead them to staying longer, which often means the drinks continue to flow. 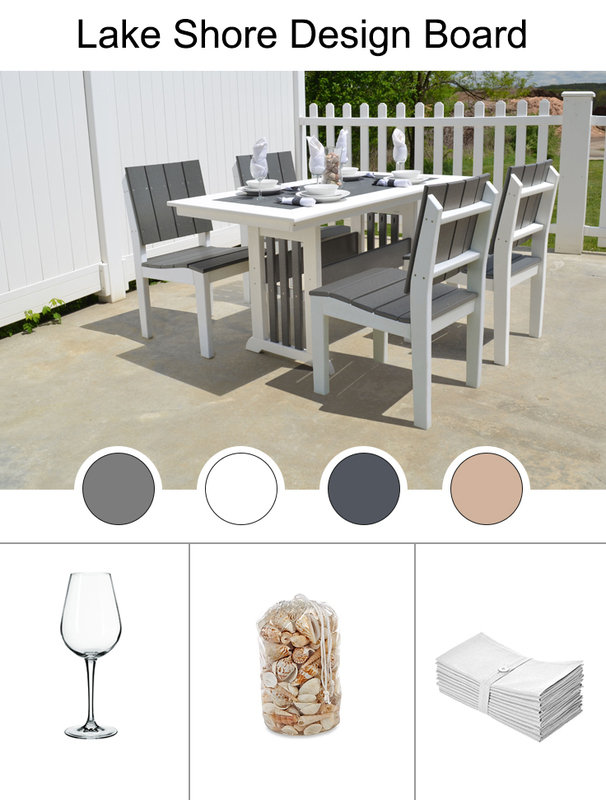 By allocating happy hour to your patio space, you are giving guests a place to gather together and increase your sales simultaneously. 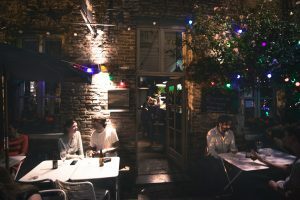 With profit margins on bar drinks being anywhere from 60-85%, depending on the beverage, you can still make a pretty penny on patrons that are ready to blow off steam after work. Just make sure you have a bar that is fully-staffed and ready to roll in your outdoor area to reduce staff having to run back and forth. Once your patio is up and running, keep these tips at the top of your mind to ensure continued success. Maintain your patio. Keep your furniture clean and floor space free of garbage. If something spills, clean it up. Don’t use your extra outdoor space as a graveyard for uneven tables and less than supportive chairs. The patio can be a goldmine for increasing your profits, so make it look like that. Keep up with outdoor trends. According to the National Restaurant Association, you should be updating your patio every five to seven years to keep it looking modern, similar to your dining room. Your outdoor patio is an extension of your restaurant; don’t let the average passersby think otherwise. Staff appropriately. 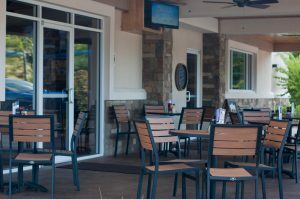 You don’t want your indoor crowd to suffer at the hands of your outdoor patio, especially at peak dining times. Depending on what stage your patio is in (fully-functioning, needs improvement, or non-existent), will give you a ballpark of how much you need to pour in to make it a successful space. Having a patio space will not break your business, but it certainly could help make it. Let our customer care representatives guide you on your journey to furnishing the perfect outdoor patio at 1-800-986-5352. As anyone who has ever walked through a fixer upper home can attest, design trends can go from cutting edge, to quaint, to downright dated, if not changed. The same concept applies to restaurants and bars. The dining area, where guests eat, plays a major role in how they experience the menu and ultimately, the opinions they form about a restaurant. To bring you emerging design trends, we spoke to Lauren Williams, Director of Design for Primanti Bros. Restaurants, about where she sees the future of restaurant design heading including lighting, colors, and dining styles. 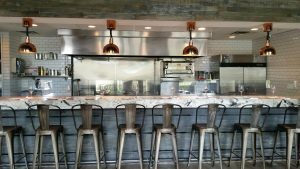 Many restaurants that you enter today will have some form of an Edison bulb giving off light; the bulb has its own sort of appeal and definitely gives any space an industrial chic vibe, but patrons are starting to experience some fatigue with the trend. What was once a unique way to light a space has become so commonplace that it fails to make a restaurant stand out. While the bulbs are beautiful in their own way, sometimes they can leave a space feeling a little too dark compared to some of their brighter counterparts. Allowing more light into a restaurant can be achieved through either large windows that encourage natural light to fill the space or with more powerful lights and light fixtures. A unique way to achieve those large windows is by incorporating glass garage doors into the front of the building. Garage doors allow for plenty of light and can either be opened to allow a cool breeze in the summer, or closed during the cooler months to prevent customers getting a chill. After several years of dark, industrial design, patrons are beginning to look towards the opposite end of the spectrum. White, bright, fresh looks that are originating in places like California and Miami are making their way across the United States. Think more boho-chic than industrial charm for the future of restaurant design. Be on the lookout for bold use of color making its way back onto the scene in the upcoming years in response to the earthy tones that have been trending for the past few years. An easy way to incorporate more color is by adding bright centerpieces to your table or hanging interesting, bright art on the walls. If you are looking for a more drastic change, consider making one of your walls into a bright mural that can be incorporated into your current design. It used to be that burger joints and formal dining spaces were mutually exclusive, but prepare to start seeing those lines blurring. Williams discussed the phenomenon as “flexibility as the number one goal. Rooms within rooms, privacy but also openness… it’s a shift to almost residential architecture”. 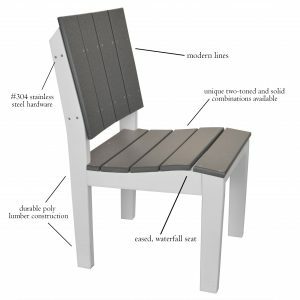 It is the trend of creating a residential feel that has communal dining furniture styles on the rise, along with more padded seats, similar to what would be found in a home. Communal dining is when a large group of diners sit at the same table to share a meal. In keeping with the trend, many restaurants have started serving meals family style with shareable plates. Large communal table tops make it easier to serve those meals on the large plates and trays that they require. Another emerging trend that contributes to creating a residential feel, is using tile to decorate areas of the dining room. Don’t be surprised to see tiles being used to create backsplashes on bars and even accent walls in restaurants. Tile, whether it is colorful or not, is a great way to bring interest into a particular area of a restaurant without being overwhelming. Designers have determined it is time for this material to shine in an area other than the bathroom and are working to bring it into more prominent areas of the restaurant. What if you own a preexisting restaurant? It wouldn’t be realistic to overhaul your entire restaurant design scheme every time the trends changed, but how do you stay relevant with what customers are looking for? According to Williams, new restaurants are more the trendsetters, while corporate restaurant groups or preexisting restaurants need to focus on maintaining their identities with subtle shifts to where the trend is appealing to their audience. A great way to do this is by “layering the vintage and the modern. Sometimes you go heavier on the modern, sometimes you go heavier on the vintage” urges Williams. It is all about reaching a balance that works for you, your restaurant, and the area you are located in. If your restaurant is a predominantly vintage style, try adding in a few modern pieces to create the layered effect. Consider changing some of your current light fixtures for brighter alternatives or replacing your current wooden menu boxes with brightly painted metal holders instead. Something to be conscious of when making any design choices, is your audience and location. Urban areas might be more accepting of trendy spots and designs that encourage communal eating, while rural areas might not be the best market to push the full trend on. 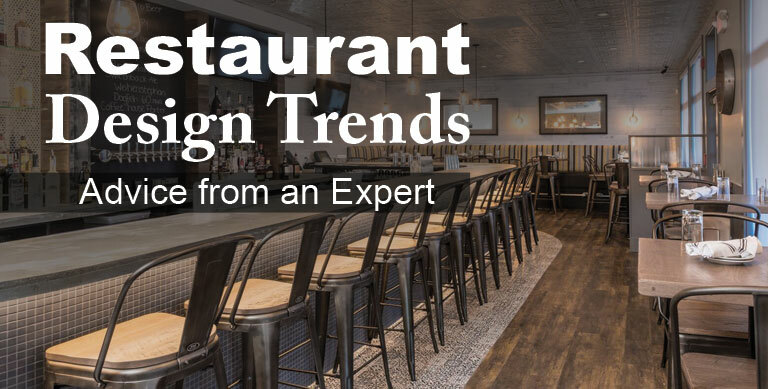 It is important for restaurant owners to stay abreast of the current design trends. Not only are these trends important to staying relevant and making sure your aesthetic doesn’t feel dated, but to giving your customers the complete experience of great food, an enjoyable atmosphere, great customer service, and a visually pleasing environment. 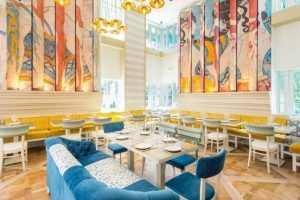 Possibly, with a few adjustments to lighting or colors, your restaurant can be on top of the emerging trends that are leading the next phase of restaurant design. Ever wondered how tall the tables, chairs, and bar stools in your restaurant are? If so, you’re not alone. One of the most frequently asked questions that we receive is “is there a standard height for restaurant furniture”. The answer is yes. Restaurant furniture dimensions are an industry standard, but not one that is designed and administered by any governing body. Nevertheless, most manufacturers adhere to the standards, at least loosely. The reason for standardization is simple: having a standard ensures that the chairs that you buy from one manufacturer will fit under the tables that you buy from another manufacturer. Without standardization, you would need to measure every table and chair before you bought them to be sure they would fit. What are the standard furniture heights? Even though there is an informal standard, manufacturers are not bound the exact height, so tables and chairs can vary by as much as an inch or two, depending on the style and thickness of materials used. Standard table height tables are 30” tall, a comfortable height that is easy for patrons to reach, while allowing them to rest their feet on the ground. It also fits wheelchairs well, so it is perfect for ADA compliance. Standard table height chairs are 18” from the top of the seat to the ground, which leaves a 10”-12” to the bottom of the table for your customer’s legs. Standard counters and counter height tables are 36” tall. You won’t find too many commercial quality restaurant counter height tables or bases on the market. The reason is that most restaurants stick with either table or bar height. Standard Counter Height Stools are 24”, which again leaves 10-12” of leg room for customers. Counter height stools are more popular for residences because they fit perfectly under a 36” kitchen counter. 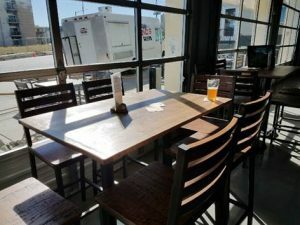 Commercial quality stools are more difficult to find due to the fact that most restaurants don’t have counters anymore. Standard bar height stools are 30” from the top of the seat to the ground; they fit well under both bars and bar height tables. Bar stools are available in a wide range of styles and materials because they are so common in restaurants, bars, casinos, and resorts. Posted on Jun 6, 2017 in Frequently Asked Questions • Comments Off on How Tall Are Restaurant Tables, Chairs, & Bar Stools?